The following is a translation of True Mother's Hoon Dok Hae at the Cheon Jeong Gung in Korea on December 1, 2013 (HC 10.29). This is an unofficial translation from Rev. Kambashi and should not be considered authoritative or quoted in any publication without prior permission from FFWPU. "Have you determined yourselves to become filial children and patriots who establish the fatherland of the Heavenly Parent and True Parents? We have little time to be able to fulfill such a big responsibility. True Father should have been resting in peace in the spirit world, but True Father's image, which was always serious with the desire to save God's lost children more than with caring about his physical body, has not yet erased itself from my mind. We on Earth must fulfill our responsibilities." "When we become one in heart, body and mind with our True Parents during our brief time on Earth, our descendants will receive heavenly fortune. When we can't accomplish our responsibilities, we will turn over the path of indemnity to our descendants. We shouldn't leave them take on the responsibility of indemnity." In reference to the current political issues in east and north Asia, True Mother said, "From now on, the world cannot help but become one. As the east and north Asian regions move towards becoming one, they are currently experiencing difficulties such as the kind felt at giving birth. The process is that painful. It is only us Unificationists who can put in to order and educate such a messy world. It is not with weapons but through education of the truth that we will do this. My message will be given with such content at the event held on Dec. 15th." 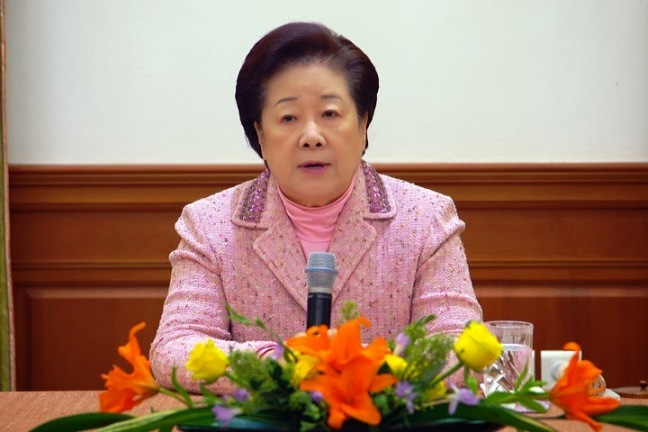 She also emphasized that all Unificationists must offer more Jeong Seong in prayer towards these goals. True Mother spoke about unifying with True Parents in order for our descendants to receive Heaven's fortune. True Mother closed the meeting that day saying, "All the Blessed families and our providential companies that True Father established must be united in order to accomplish our responsibilities so that True Father's words won't just fall to the wayside.